The Book of Nahum is the seventh book of the 12 minor prophets of the Hebrew Bible. It is attributed to the prophet Nahum, and was probably written in Jerusalem in the 7th century BC. According to some, Nahum prophesied in the beginning of the reign of Ahaz (740s BC). Others, however, think that his prophecies are to be referred to the latter half of the reign of Hezekiah (8th century BC). The book would then have been written in Jerusalem, where Nahum would have witnessed the invasion of Sennacherib and the destruction of his host (2 Kings 19:35). The scholarly consensus is that the "book of vision" was written at the time of the fall of Nineveh at the hands of the Medes and Babylonians (612 BC). This theory is demonstrated by the fact that the oracles must be dated after the Assyrian destruction of Thebes, Egypt in 663 BC as this event is mentioned in Nahum 3:8. Little is known about Nahum’s personal history. His name means "comforter," and he was from the town of Alqosh, (Nahum 1:1) which scholars have attempted to identify with several cities, including the modern `Alqush of Assyria and Capharnaum of northern Galilee. He was a very nationalistic Hebrew, and lived amongst the Elkoshites in peace. His writings were likely written in about 615 BC, before the downfall of Assyria. The subject of Nahum's prophecy is the approaching complete and final destruction of Nineveh, the capital of the great and at that time flourishing Assyrian empire. Ashurbanipal was at the height of his glory. Nineveh was a city of vast extent, and was then the center of the civilization and commerce of the world, according to Nahum a "bloody city all full of lies and robbery" (Nahum 3:1), a reference to the Neo-Assyrian Empire's military campaigns and demand of tribute and plunder from conquered cities. Jonah had already uttered his message of warning, and Nahum was followed by Zephaniah, who also predicted (Zephaniah 2:4–15) the destruction of the city. Nineveh was destroyed apparently by fire around 625 BC, and the Assyrian empire came to an end, an event which changed the face of Asia. Archaeological digs have uncovered the splendor of Nineveh in its zenith under Sennacherib (705–681 BC), Esarhaddon (681–669 BC), and Ashurbanipal (669–633 BC). Massive walls were eight miles in circumference. It had a water aqueduct, palaces and a library with 20,000 clay tablets, including accounts of a creation in Enuma Elish and a flood in the Epic of Gilgamesh. The Babylonian chronicle of the fall of Nineveh tells the story of the end of Nineveh. Nabopolassar of Babylon joined forces with Cyaxares, king of the Medes, and laid siege for three months. Assyria lasted a few more years after the loss of its fortress, but attempts by Egyptian Pharaoh Neco II to rally the Assyrians failed due to opposition from king Josiah of Judah, and it seemed to be all over by 609 BC. Chapters two and three describe the fall of Nineveh, which later took place in 612 BC. Nineveh is compared to Thebes, the Egyptian city that Assyria itself had destroyed in 663 BC. Nahum describes the siege and frenzied activity of Nineveh’s troops as they try in vain to halt the invaders. Poetically, he becomes a participant in the battle, and with subtle irony, barks battle commands to the defenders. Nahum uses numerous similes and metaphors . Nineveh is ironically compared with a lion, in reference to the lion as an Assyrian symbol of power; Nineveh is the lion of strength that has a den full of dead prey but will become weak like the lion hiding in its den. It comes to conclusion with a taunt song and funeral dirge of the impending destruction of Nineveh and the "sleep" or death of the Assyrian people and demise of the once great Assyrian conqueror-rulers . From its opening, Nahum shows God to be slow to anger, but that God will by no means ignore the guilty; God will bring his vengeance and wrath to pass. God is presented as a God who will punish evil, but will protect those who trust in Him. The opening passage (Nahum 1:2–3) states: "God is jealous, and the LORD revengeth; the LORD revengeth, and is furious; the LORD will take vengeance on his adversaries, and he reserveth wrath for his enemies. The LORD is slow to anger, and great in power, and will not at all acquit the wicked". God is strong and will use means, but a mighty God doesn't need anyone else to carry out vengeance and wrath for him. Nahum 1:3 (NIV) The LORD is slow to anger and Quick to love; the LORD will not leave the guilty unpunished. God's judgement on Nineveh is "all because of the wanton lust of a harlot, alluring, the mistress of sorceries, who enslaved nations by her prostitution and peoples by her witchcraft" (Nahum 3:4 NIV). Infidelity, according to the prophets, related to spiritual unfaithfulness. For example: "the land is guilty of the vilest adultery in departing from the LORD" (Hosea 1:2 NIV). The apostle John used a similar analogy in Revelation chapter 17. No one of the minor Prophets seems to equal the sublimity, the vehemence and the boldness of Nahum: besides, his Prophecy is a complete and finished poem; his exordium is magnificent, and indeed majestic; the preparation for the destruction of Nineveh, and the description of its ruin, and its greatness, are expressed in most vivid colors, and possess admirable perspicuity and fulness. Nahum, taking words from Moses himself, have shown in a general way what sort of "Being God is". The Reformation theologian Calvin argued, Nahum painted God by which His nature must be seen, and "it is from that most memorable vision, when God appeared to Moses after the breaking of the tables." The book could be seen as an allusion to the history as described by Moses; for the minor Prophets, in promising God’s assistance to his people, must often remind how God in a miraculous manner brought up the Jews from Egypt. ↑ "CATHOLIC ENCYCLOPEDIA: Nahum". newadvent.org. ↑ "Saudi Aramco World : Nineveh". saudiaramcoworld.com. ↑ "CREATION MYTHS IN THE ANCIENT NEAR EAST". uoregon.edu. ↑ "The fall of Nineveh Chronicle (ABC 3)". livius.org. ↑ "ANE History: The End of Judah". theology.edu. ↑ "Assyria, 1365609 B.C.". metmuseum.org. ↑ "Commentaries on Twelve Minor Prophets". 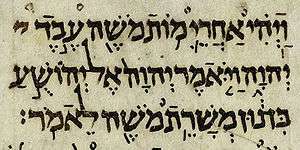 Wikimedia Commons has media related to Book of Nahum. Chisholm, Hugh, ed. (1911). "Nahum". Encyclopædia Britannica (11th ed.). Cambridge University Press. This article also contains a section on the Book of Nahum. This article incorporates text from a publication now in the public domain: Easton, Matthew George (1897). "Nahum". Easton's Bible Dictionary (New and revised ed.). T. Nelson and Sons.